Outside the Bible, the recognition of twelve months in the lunar calendar made the number twelve an important symbol for the annual cycles of life. In the Bible, this number usually symbolizes completeness, especially with regard to the people of God. Once the twelve tribes of Israel were established, uses of the number twelve became a symbol pointing to the entire people of God. In the Old Testament, the number twelve immediately points to the twelve sons of Jacob and the twelve tribes or clans that descended from them that became the nation of Israel. When Jacob was dying, the blessings he bestowed on each of his sons foresaw not only their character but the history of those who would be born in their lineage: “These are the 12 tribes of Israel and what their father said to them when he gave each of them his special blessing” (Gen. 49:28). The number of the tribes determined many of the symbolic actions in the unfolding story of the people of Israel. During the time at Mount Sinai, Moses built an altar before the Lord out of twelve stones, one for each of the tribes he had led from Egypt (Exod 24:4). As the people prepared to enter the Promised Land for the first time, a representative of each tribe was chosen to scout the land, resulting in the twelve spies who brought back a mixed report on the land and the possibilities of conquering it. The majority report by ten incited the people to rebel against God and set in motion a forty-year detour into the wilderness (Num 13:1-16). Four decades later, when Joshua led Israel across the paused Jordan River, he instructed men from each tribe to pick up twelve stones to create a lasting memorial of the historic crossing (Josh 3-4). Another instance of this memorial use of twelve was put into practice by Elijah when he had his showdown with the priests of Baal on Mount Carmel. First Kings 18:31-32 describes the prophet’s deliberate actions, a startling contrast to the frantic efforts the pagan priests had been exercising all day. He built an altar of twelve stones representing the twelve tribes of Israel. Instead of optimizing his chances for success, he made them worse by dousing the entire offering repeatedly with water. And when everything was soaked, he invited God to demonstrate his power. The offering, stone altar, and water were consumed by fire from heaven. The God who had brought Israel into being and promised to be her God stood by his promises that day. In the New Testament, the number twelve almost always refers to the men Jesus chose. “He appointed twelve whom he called apostles. They were to accompany him and to be sent out by him to spread the Good News” (Mark 3:14). In a number of places the disciples are simply called “the Twelve” (Matt 26:14; Mark 9:35; 11:11; Luke 8:1, all NIV). Although Jesus’ disciples were not chosen from specific tribes of Israel, their number was significant. He even promised his disciples, “When the Son of Man sits on his glorious throne in the world to come, you, my followers, will also sit on twelve thrones, judging the twelve tribes of Israel” (Matt 19:28). In addition, twelve baskets of food were left after the feeding of the five thousand, symbolic of the restoration of Israel that Jesus was ushering in (Mark 6:43; 8:19). James referred to “the twelve tribes” –Jewish believers scattered abroad” in a similar symbolic reference to Jesus’ redemption of Israel (James 1:1 NLT). The number twelve is featured prominently in the book of Revelation, bringing back the significance of the tribes of Israel as part of God’s eternal Plan. John is told in his vision (7:5-8) that 144,000 persons, 12,000 from each of the tribes of Israel, will be “sealed” for God, along with “a large crowd from every nation, tribe, people, and language. No one was able to count how many there were” (7:9). When the New Jerusalem appears, “coming down from God out of heaven” (21:2), many of its features come in twelve: twelve gates featuring the names of the twelve tribes and twelve guardian angels at the gates. The measurements of the city are multiples of twelve. The words of jesus to the disciples echo in the description of the foundation of the New Jerusalem: “The wall of the city had 12 foundations. The 12 names of the 12 apostles of the lamb were written on them” (21:14). And in a final picture that reminds us of the Garden of Eden, John sees, “Between the street of the city and the river there was a tree of life visible from both sides. It produced 12 kinds of fruit. Each month had its own fruit. The leaves of the tree will heal the nations” (22:2). 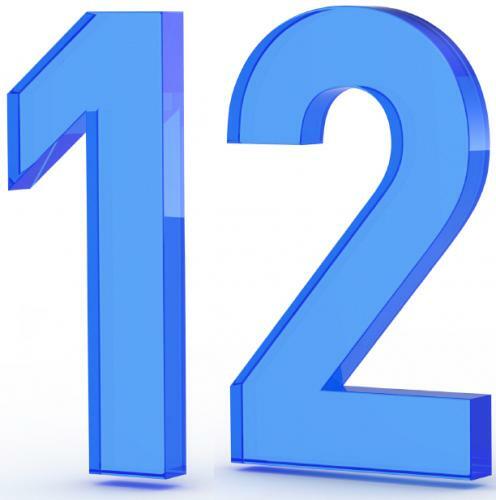 The number Twelve is a continual symbol in Scripture that points to God’s covenant promises to the twelve tribes of Israel. Every time we see the number twelve, we are reminded of God’s redemption of his people. Revelation 21:10-14: He showed me the holy city, Jerusalem, coming down from God out of heaven. It had the glory of God. Its light was like a valuable gem, like gray quartz, as clear as crystal. it had a large, high wall with 12 gates. Twelve angels were at the gates. The names of the 12 tribes of Israel were written on the gates. There were three gates on the east, three gates on the north, three gates on the south, and three gates on the west. The wall of the city had 12 foundations. The 12 names of the 12 apostles of the lamb were written on them. The number twelve symbolizes the ongoing community of faith in whose history God’s salvation is worked out; the history of the twelve apostles, who represent the true church. . . The apostles did not bear witness to a “brand new” thing, as though God revealed one things to Israel and another thing to the church; God is one God. . .The wall surrounding new Jerusalem symbolizes the fulfillment of Israel’s hope for God’s shalom and locates its final realization in the community of overcomers. NOTE: Look at the faith in Jairus the father of the child who was 12 years of age that was dying and look at the faith in the woman who was bleeding for 12 years (Luke 8:41-56) notice that these two individuals had Faith in Jesus that he would heal them or their love ones.